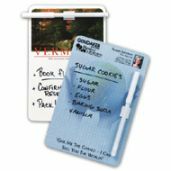 We supply bulk magnetic memo boards with your full color custom imprint and optional stock backgrounds. Budget Prices in the USA and Canada for wholesale magnetic memo boards. Typical Production: 7-10 days after art approval. Contact us if you need a rush delivery of our custom magnetic memo boards. Free artwork design. We will send you a proof for your approval before production. Prices include you full color custom imprint: you may use a color photo or an unlimited number of imprint colors. Setup Charge: $25.00 per order; no Setup Charge on repeats. - Size: 5 1/2" X 8 1/4"
- Material: 12pt. Glossy Laminated Paper with .045 magnets attached to the back. - Wet erasable pen and clip (packaged bulk).